Now that you have your .mobi file complete, it’s time to create the ePub files you’ll need for other online retailers like iTunes, B&N (Nook Press), Kobo, All Romance e-books, Smashwords, etc. 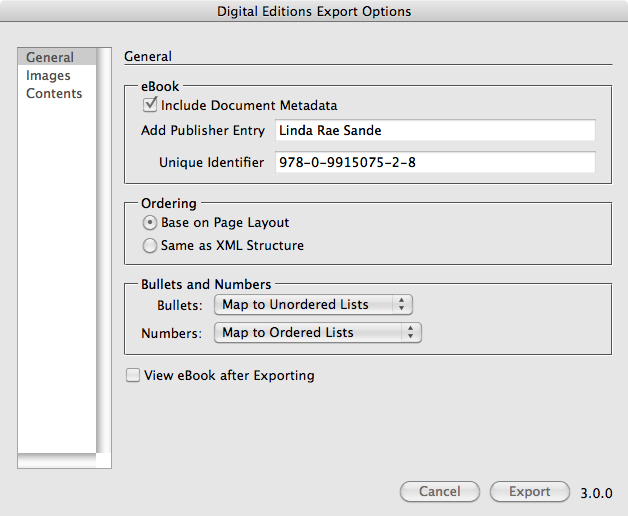 From the bookfile palette menu, choose Export Book to EPUB. Note: ISBNs are required for iTunes, B&N and Kobo as well as other retailers. They can be purchased from Bowker at http://www.myidentifiers.com. 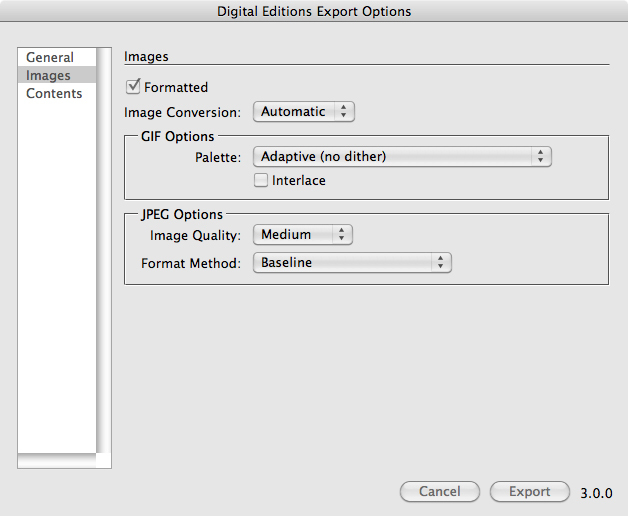 In the Images pane, complete the information as shown below if your book includes images other than the cover. Next, you’ll need to test your ePub file. Download Adobe Digital Editions from http://www.adobe.com/solutions/ebook/digital-editions/download.html. 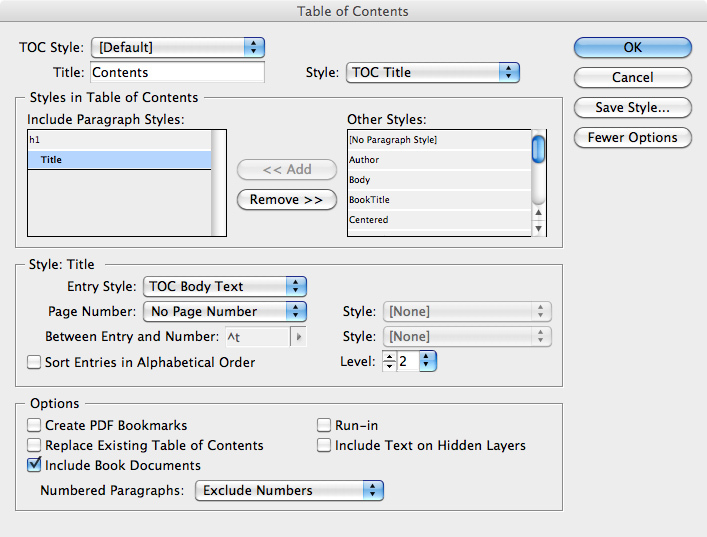 This free application will allow you to check your file for proper formatting and navigation. 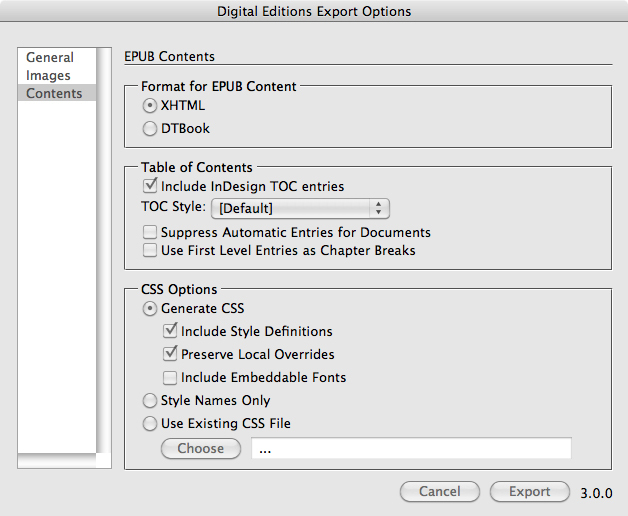 If you find a problem with formatting, usually due to incorrect paragraph or character style tags, go back to the InDesign source files and make the corrections. Your ePub file can be used without further manipulation on sites such as Nook Press and ARe. 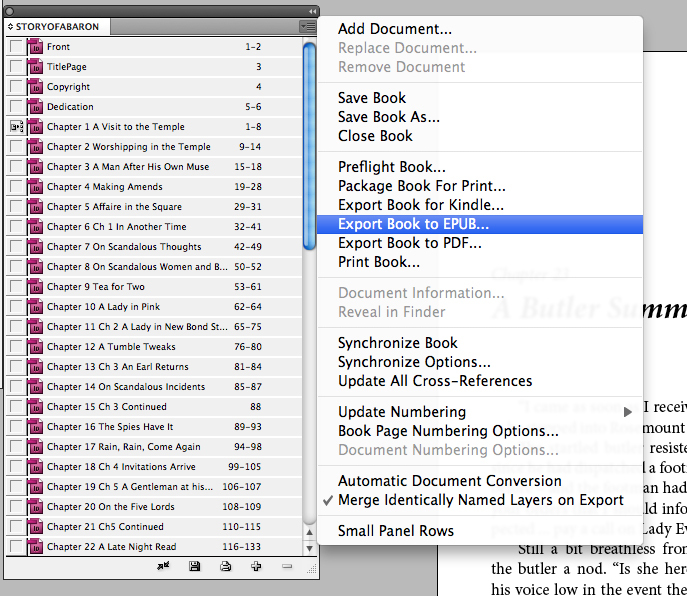 You will need to download and use Calibre, a free application, to manipulate your ePub to work on iTunes and Smashwords. In Calibre, run the Startup Wizard. 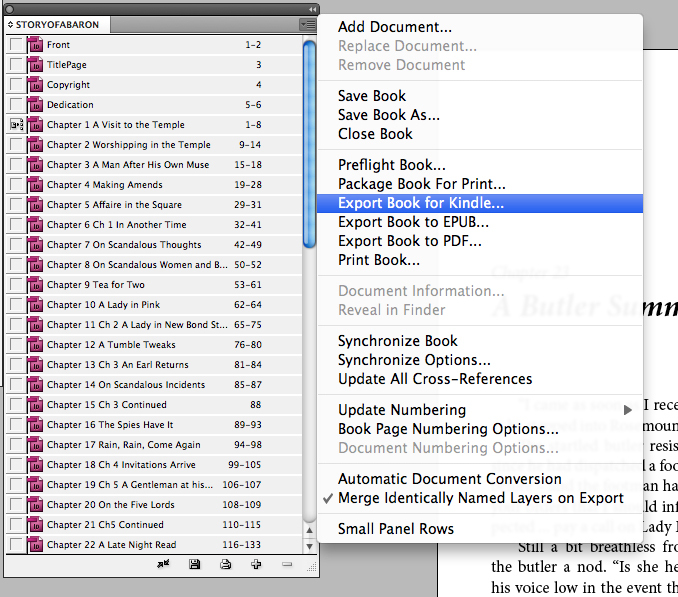 Rerun the Startup Wizard in Calibre for Kobo and repeat the steps to create a Kobo-specific ePub file. That’s it! Once you have your ePubs uploaded to the various online retailers, it’s time to start writing another book. Good luck! 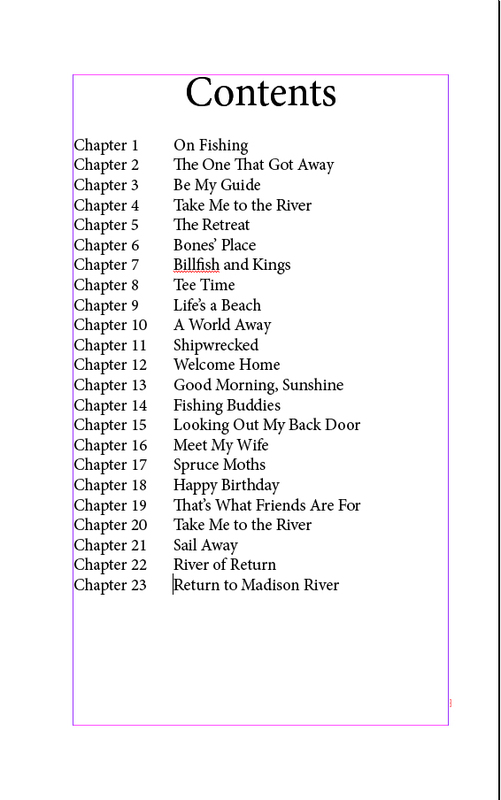 Now that you have your book formatted for paperback printing, it’s time to set up the table of contents necessary to produce the ebook versions of your book as well as generate the .mobi file for Kindle. Click OK and save the file as TOC.indd. 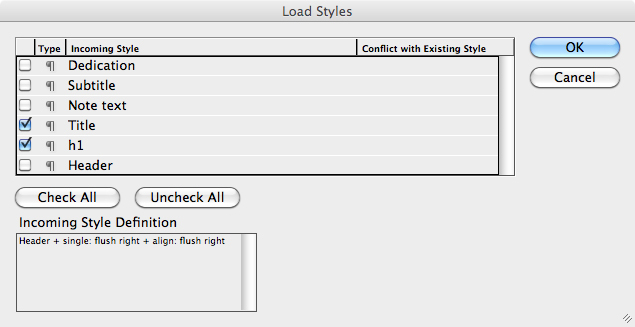 In the Export embedded fonts topdown menu, select Don’t embed any fonts. Select Preserve forced line breaks. 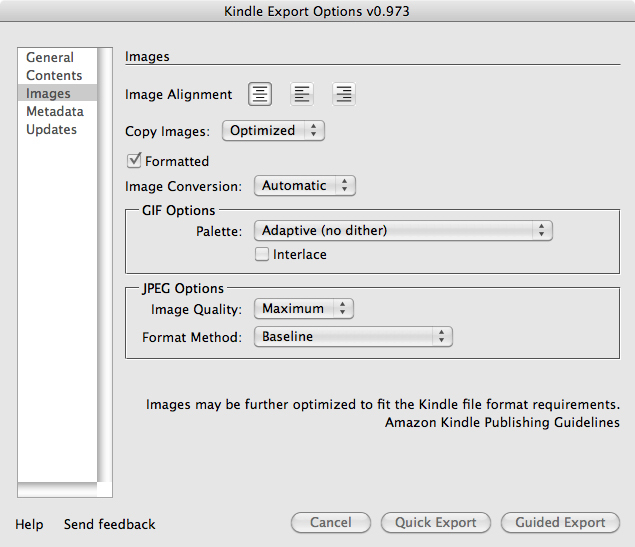 If your book includes images other than the cover file, set up the images as shown in the dialog box here. Note: You may see an error warning the first time you attempt to generate a .mobi file. 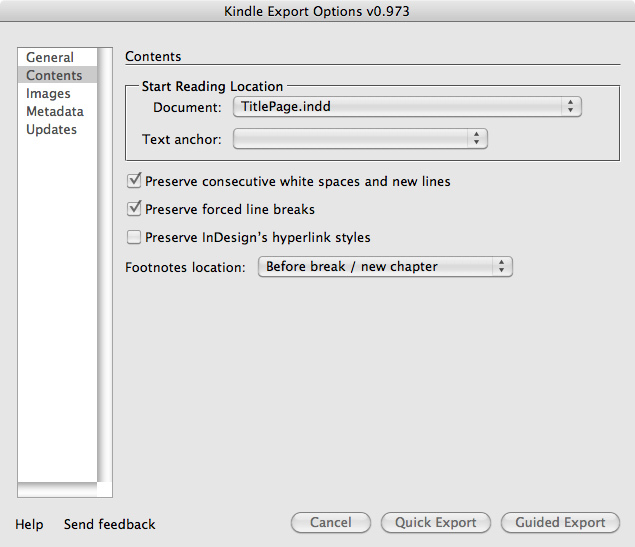 Simply select Export Book for Kindle from the bookfile again. 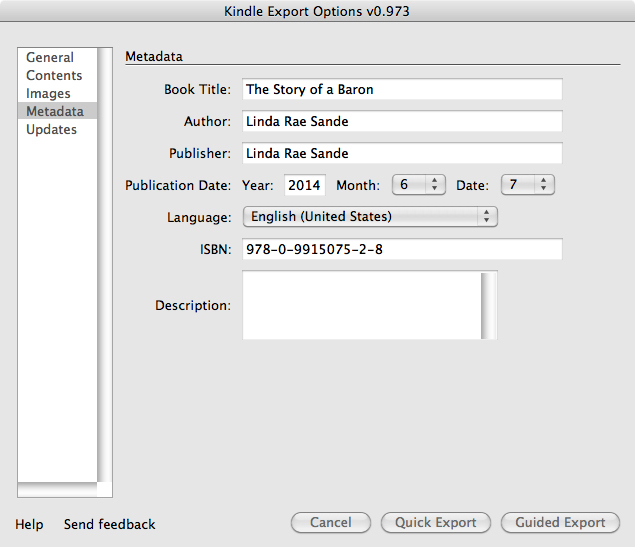 All the information you entered in the Kindle Export Options pane will still be there. Click Guided Export and the conversion should begin. Now it’s time to test your .mobi file to be sure everything has converted correctly. When you are satisfied with your .mobi book, upload it to Amazon in your KDP dashboard. 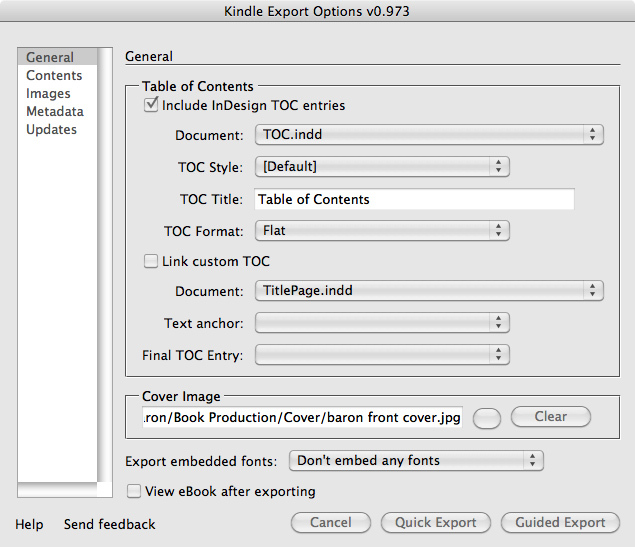 Next time, we’ll cover how to create an ePub file for other ebook retailers.